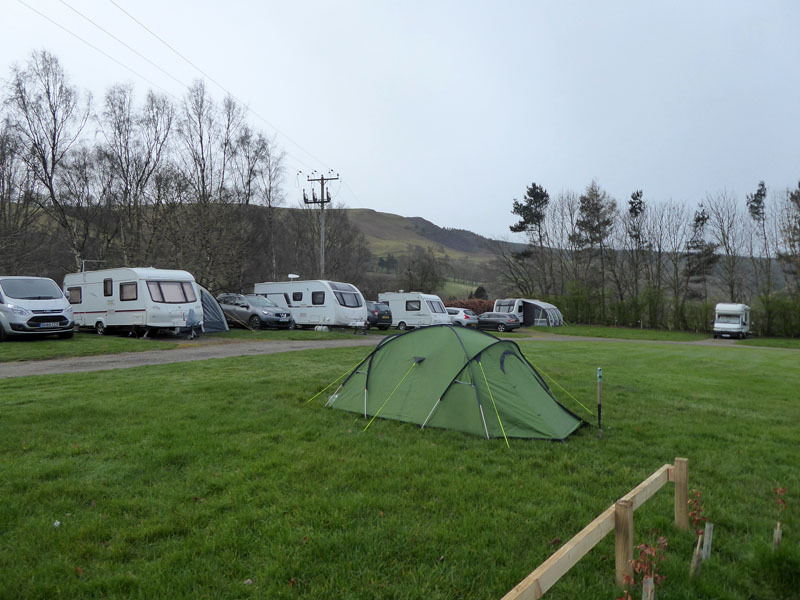 Circumstances conspired favourably to present the opportunity to start this year's camping with a trip to North Wales and a walk closely based on "The Dee Valley Way" as published by a particular website - see foot of page. 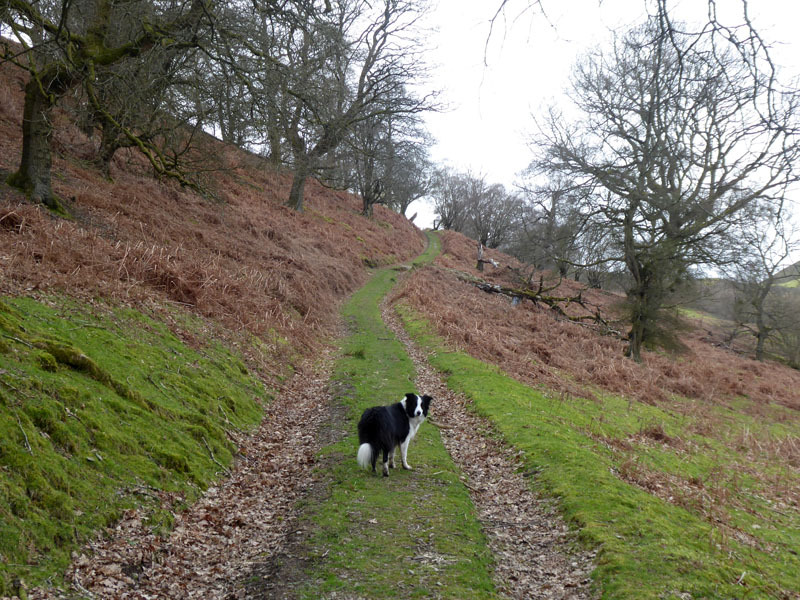 I used my discretion to vary the walk in a couple of places. 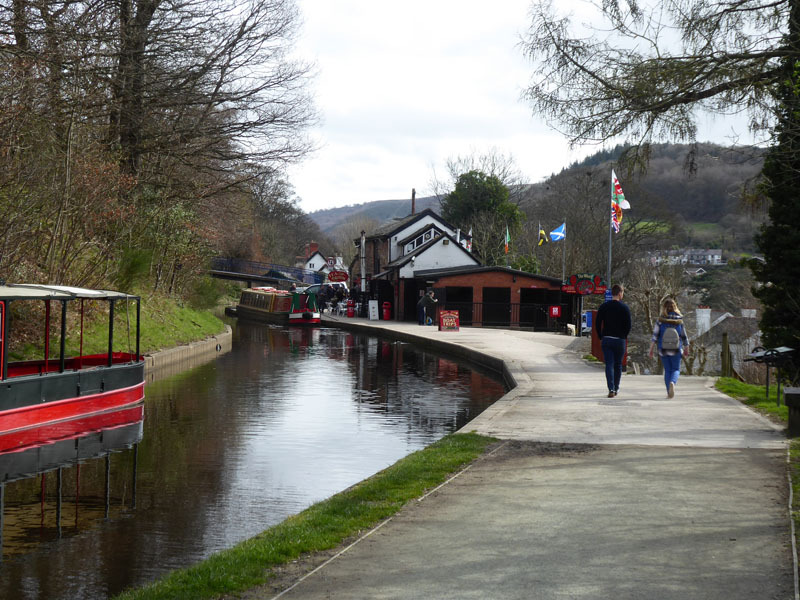 The Dee Valley Way links Corwen with Llangollen. 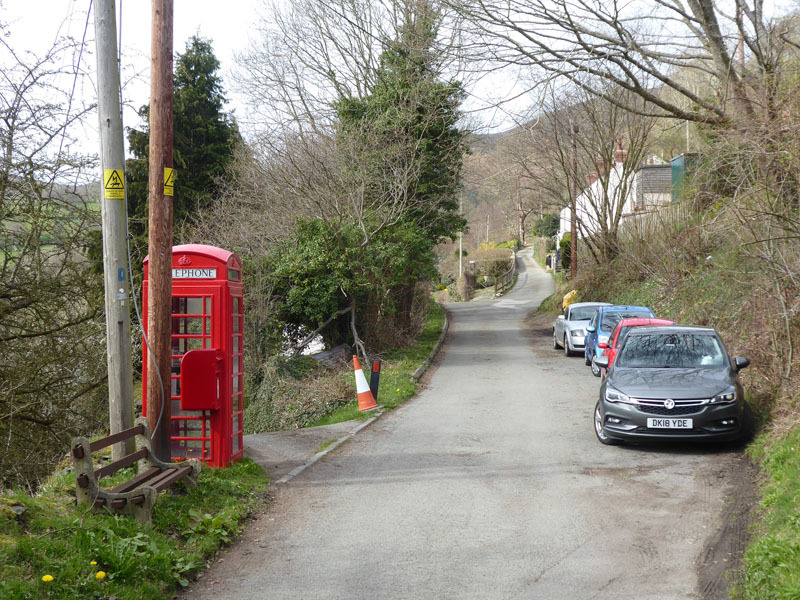 Carrog is about 4 miles from Corwen and my plan is to walk to Corwen and catch a bus to Llangollen, thus splitting the walk into two sections. I had intended to use the train to facilitate this one-way walk, but it was not possible. 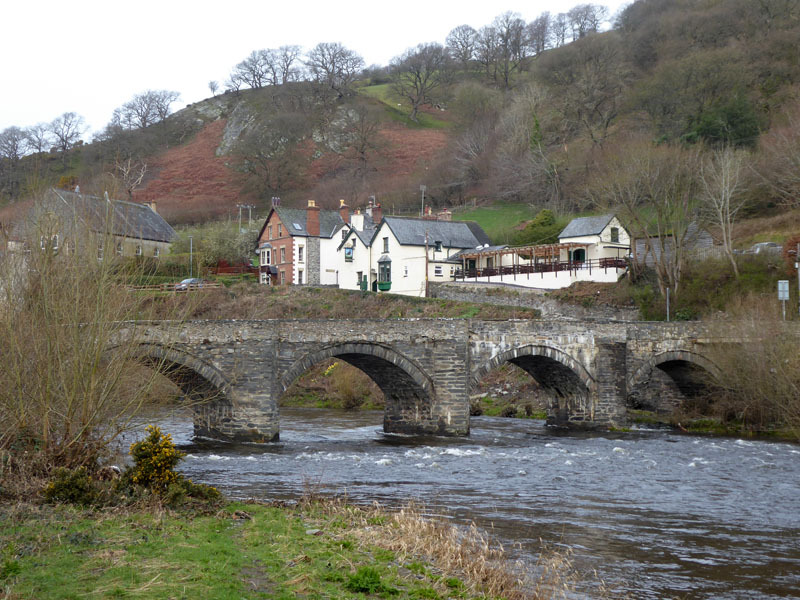 Carrog Bridge was built in 1660, some 350+ years ago. The Grouse Inn can be seen on the far side of the bridge. The river is running high after very heavy rainfall - which ended about 5 days prior. 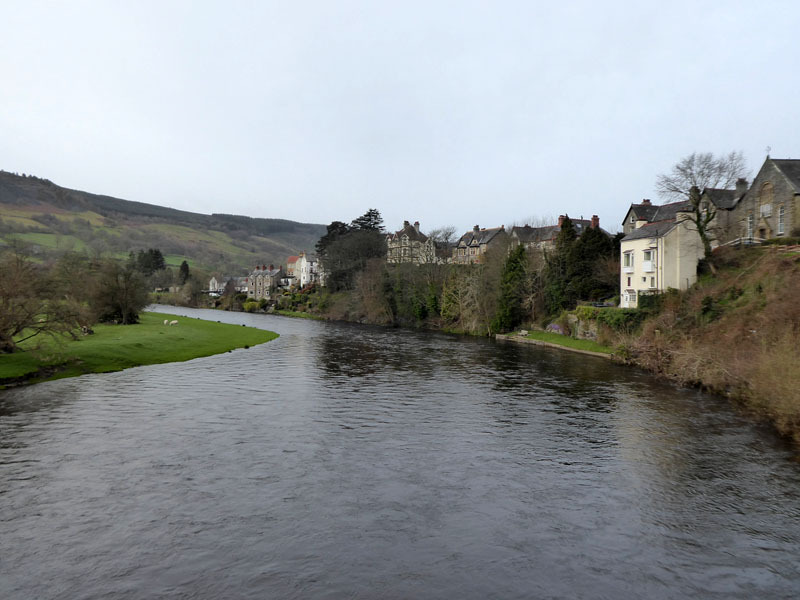 It goes to show what a large catchment area the river serves. Many photos show pebbles and spits, none of which could be seen this time. 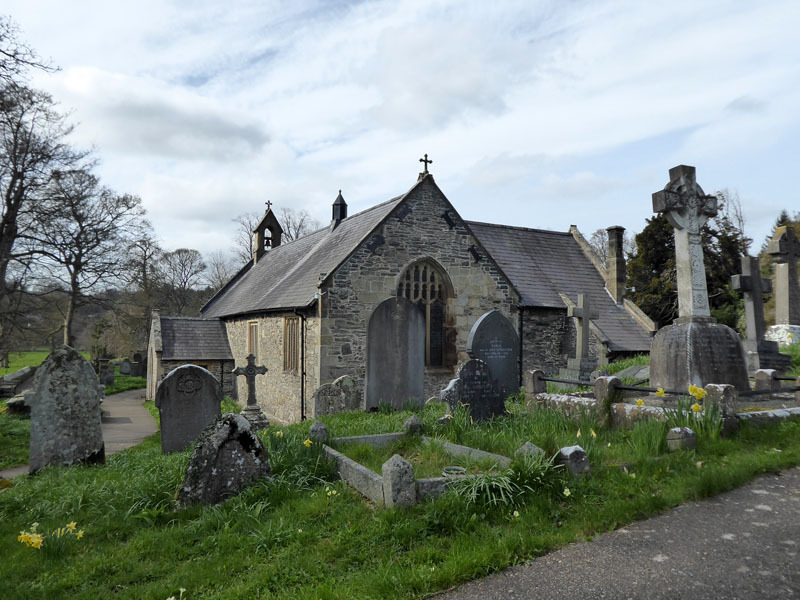 The walk followed the B5437 in a westerly direction past The Church of St.Ffraid. 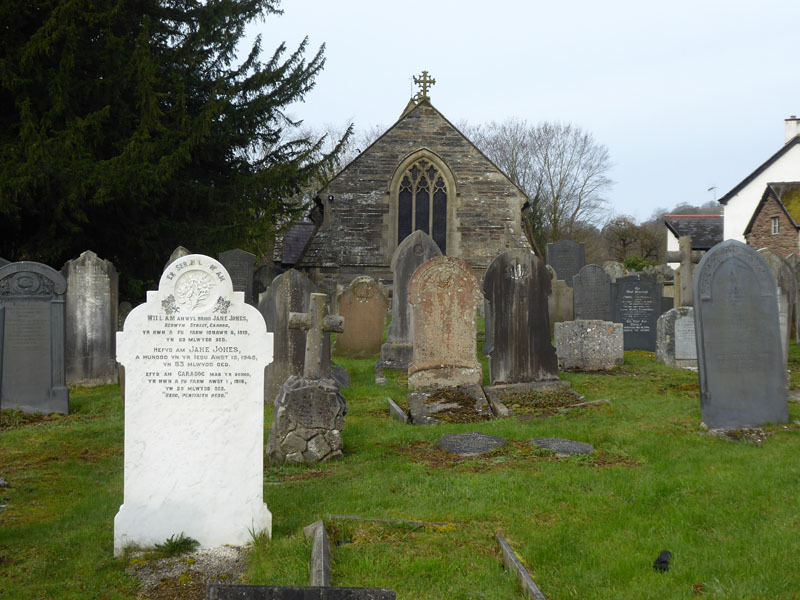 One headstone has been restored with a fine coat of white paint; it turns out to have been designated a War Grave in 1926. 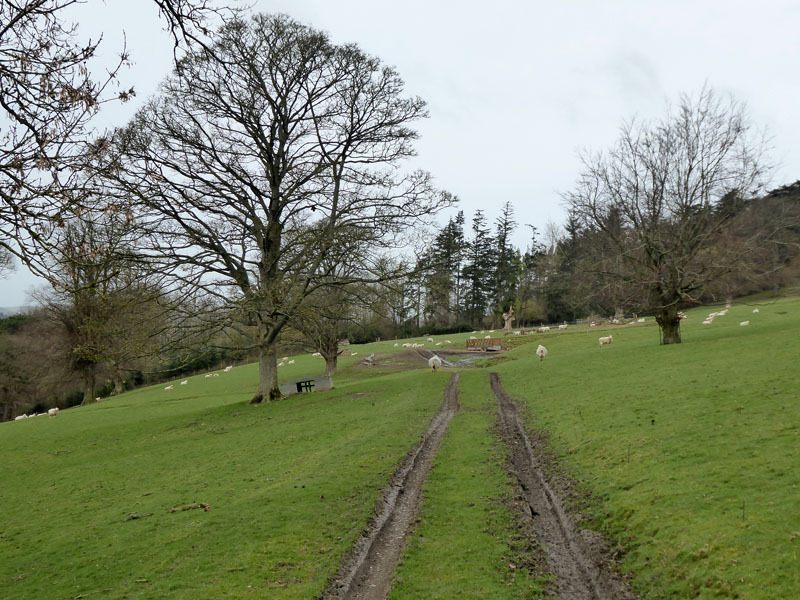 Upon turning up the B5436 for Fedw, a white house marks the point at which we can enter the countryside - just behind the house and not easy to see/find. The walk follows farmland to and north of Rhagatt Hall, the above photos were taken on rare occasions when there were no sheep in view; Molly and I enjoy our best walks when she is safely off the lead and these early stages have been predominantly on-lead for reasons of road traffic and sheep. 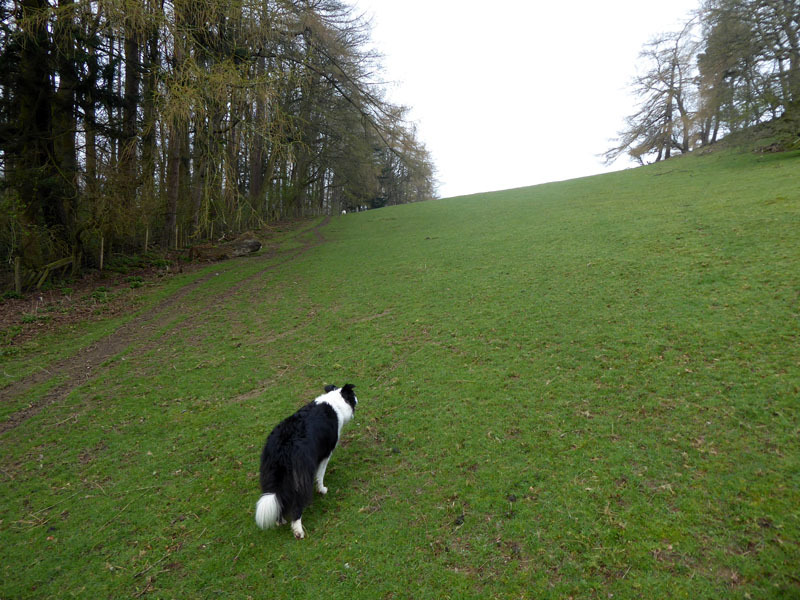 The walk follows a route down the fields and back onto the B5437. 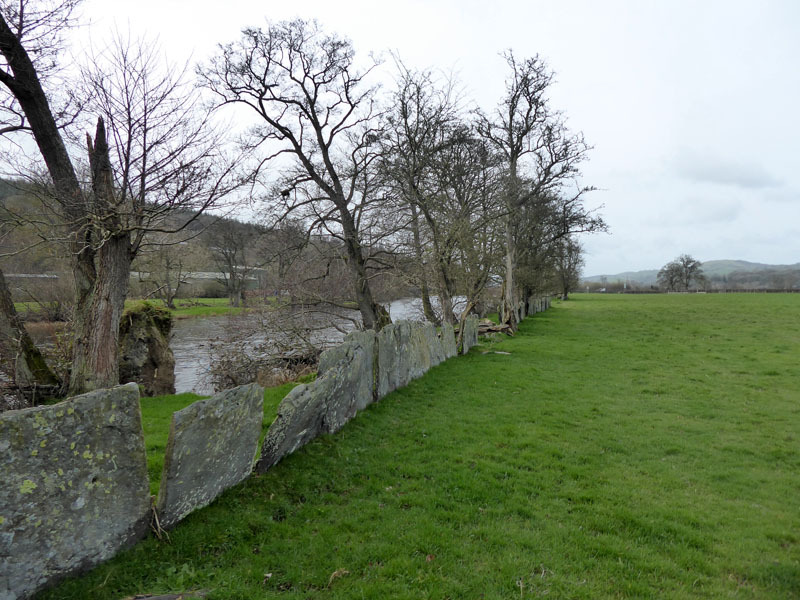 My first choice to vary the route was to walk down the south-west bank of the Dee as it makes its progress around Corwen, rather than a little circuit offered around Trewyn-Bach as per the other website. 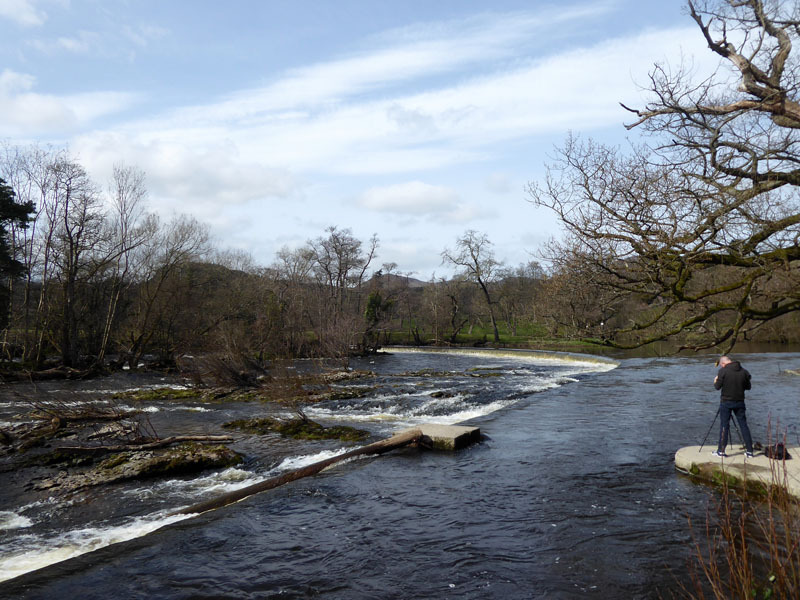 We will walk along the far side of the river (above, left) and a few minutes later that's where we are (right). 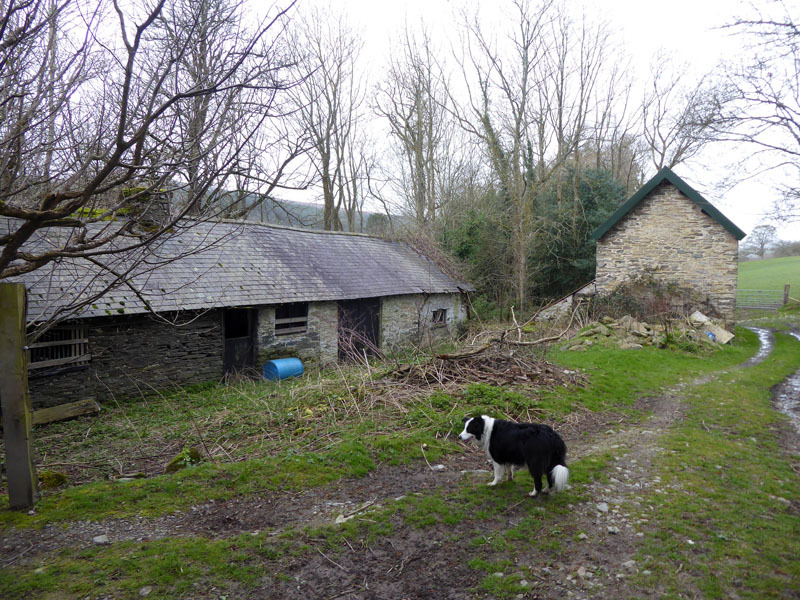 I didn't have much time to explore Corwen, not sure if that's a good or a bad thing. 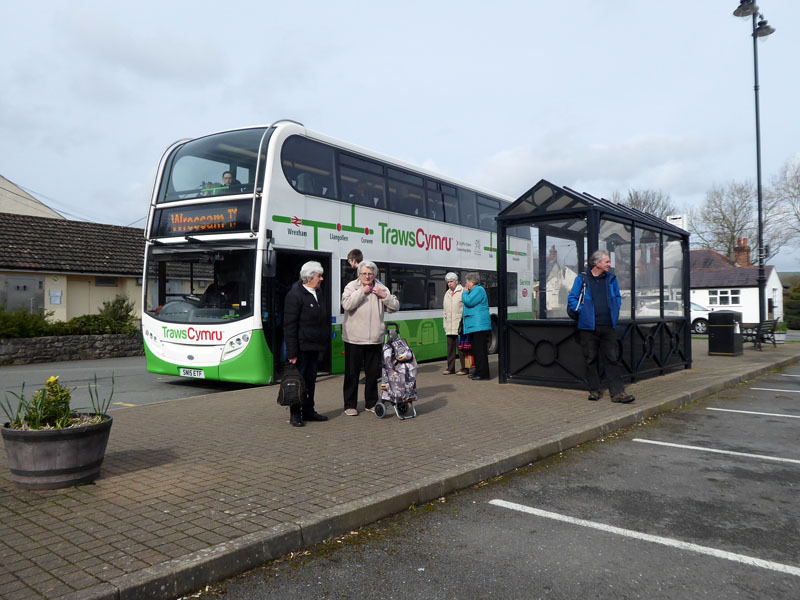 I'm looking for the bus stop for the T3 Barmouth to Wrexham bus which is due at 10:15hrs. 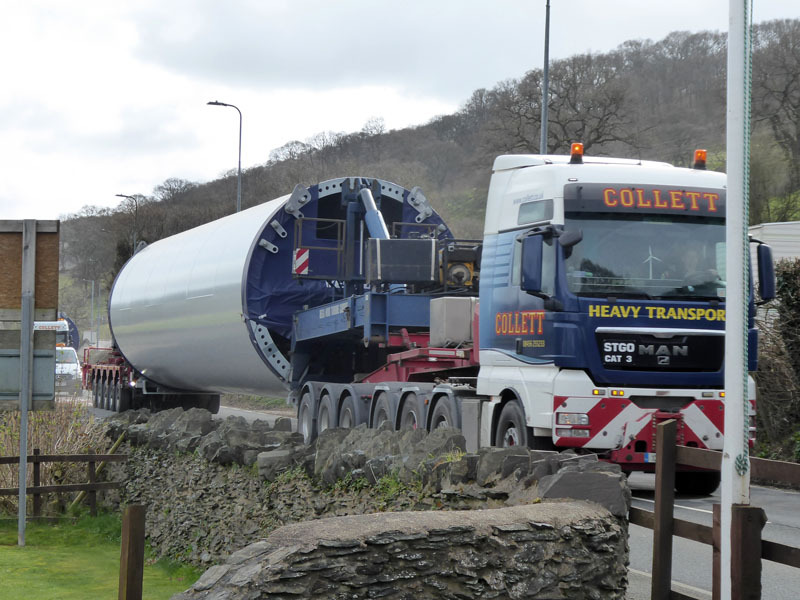 Large sections of wind turbine infrastructre came along in convoy in a smooth police-controlled operation. We must have been stopped in the pub car park (Berwyn Arms) for about 15 minutes, it struck me just how many car drivers kept their engines running(!). The bus driver switched off the engine and quite a few of us got off to watch the action. 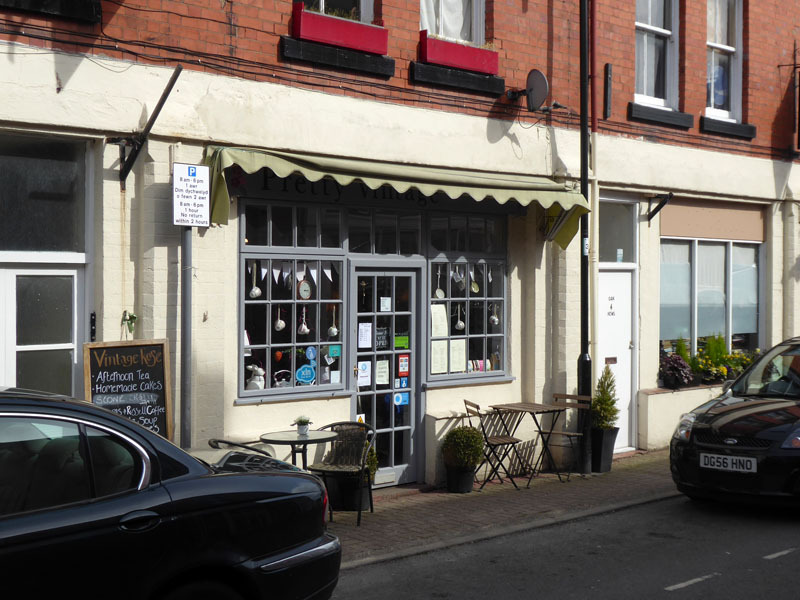 Refreshments were take at The Pretty Vintage Tearoom in Oak Street, Llangollen. Dog-friendly and good food. Part 1 of the walk is over and Part 2 is about to start. 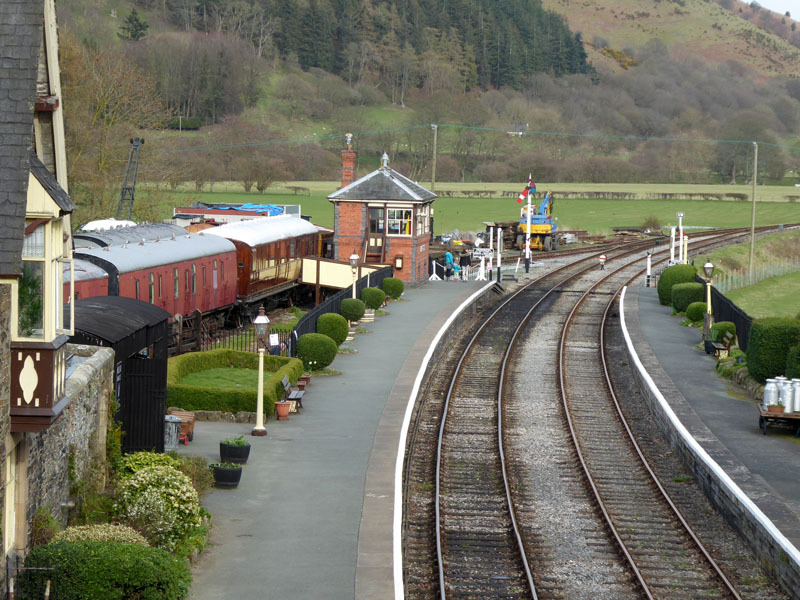 This weekend, Peppa Pig is visiting the Llangollen Railway. Consequently, no dogs other than assistance-dogs are allowed and there are no "cheap" one-way tickets available. Preserved railways pay a lot to host themed weekends like this with celebrities such as PP or Thomas etc. I suppose they know best, all I wanted was a trip on the last train and would have travelled in the guard's van (if there was one). Preservationists reopened the station and 60ft of track in 1975. 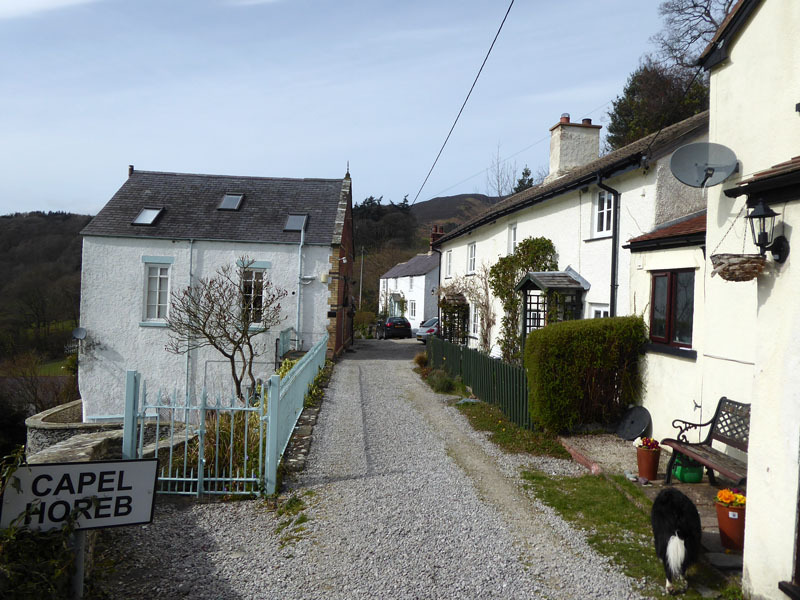 Now the line extends for 10 miles to Corwen. 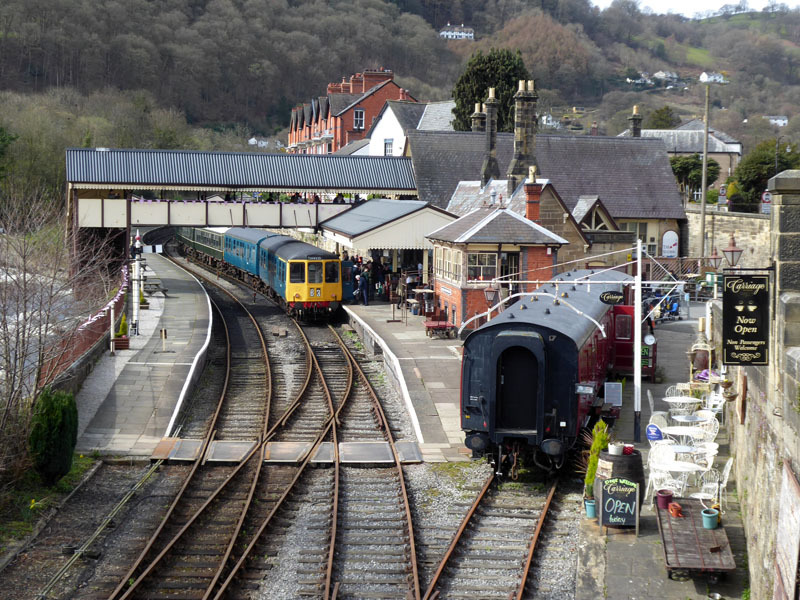 It really is located in a wonderful place and the town has so much more to offer with the railway being here. 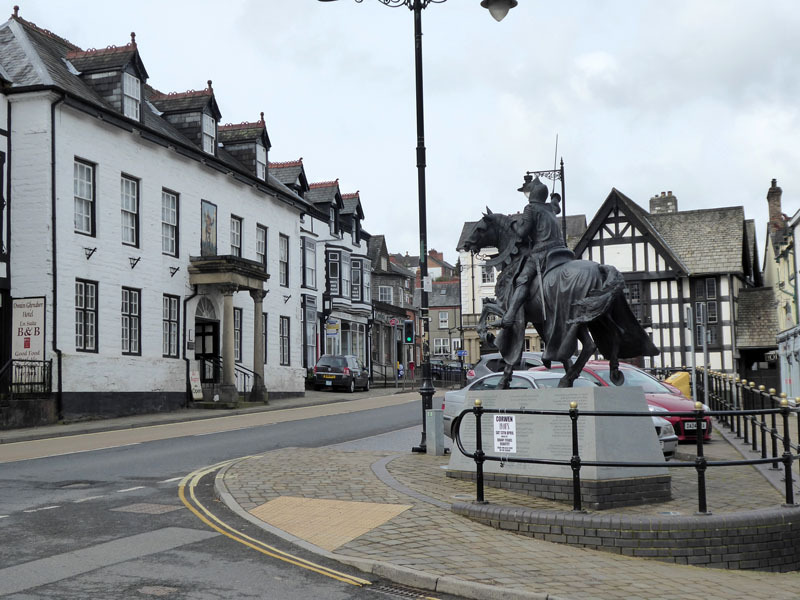 Lots of cafes and quirky shops and even a "Home Bargains" and an "Aldi". 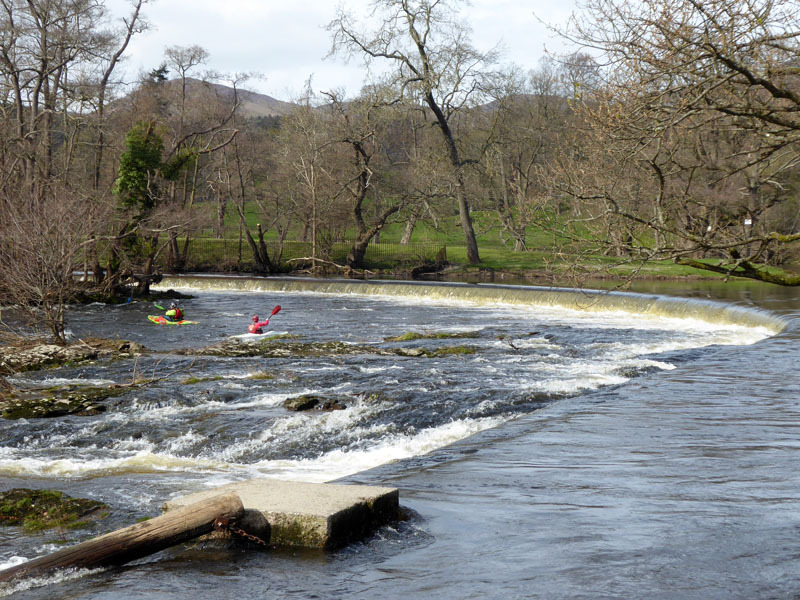 My plan is to find the canal (not difficult) and walk the towpath as far as Horseshoe Falls. 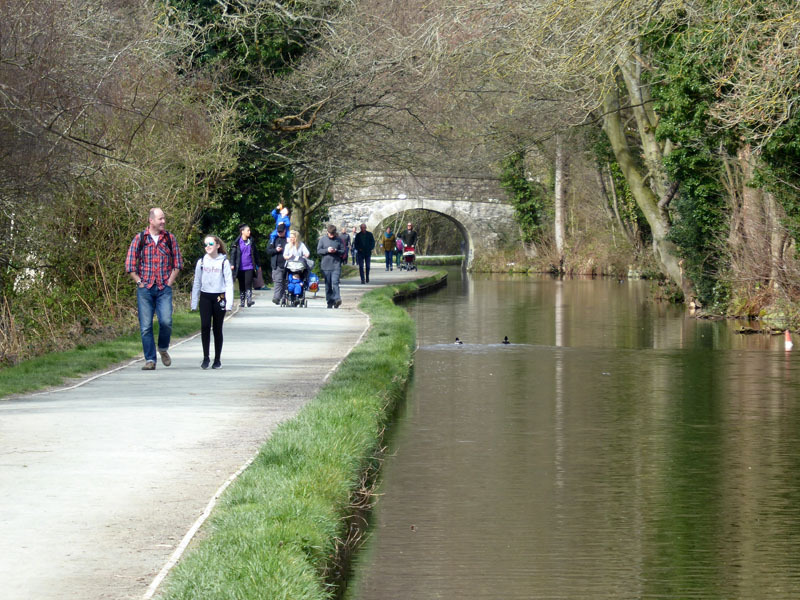 I challenge anyone to find a more enjoyable 1.5 mile canal walk. 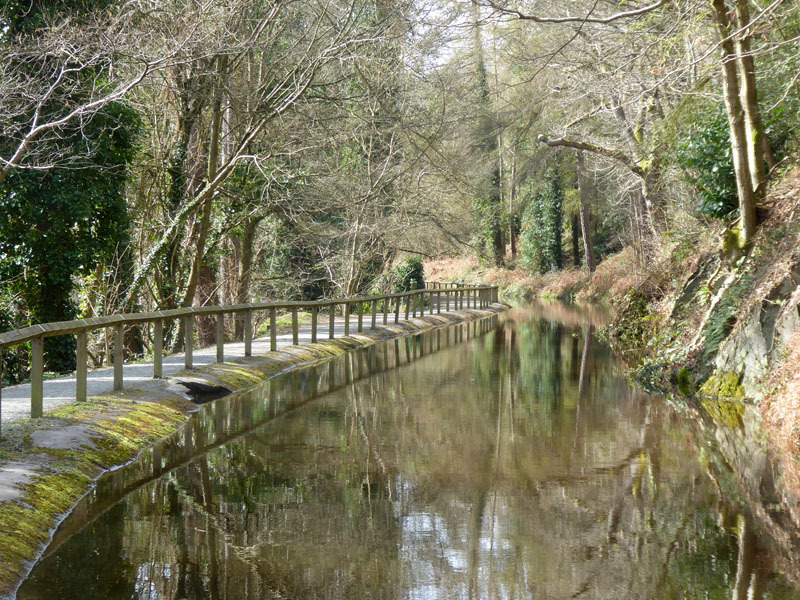 The true canal gives way to Telford's conduit of water from the Dee and it becomes a kind-of canal with a noticeable flow of water. 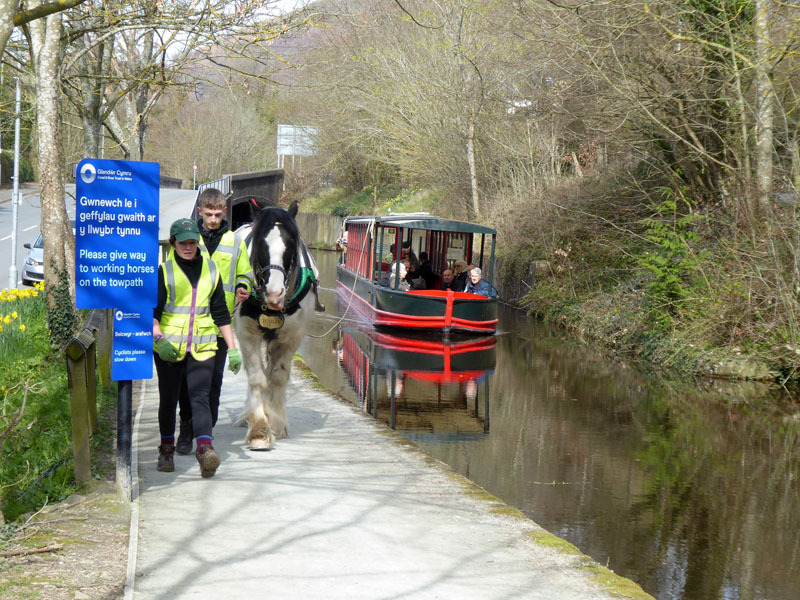 Boats are not allowed on the flowing secion, unless they are horse-drawn. Ah the Hi-Vis jackets have made it onto the towpath. If nothing else, they make the wearer feel and, to some degree look, important. Try one on, it gives you special powers! As usual, someone got there first and wasn't ready to move. Find out more here - opens in a separate window. Now rentable by the room through airBnB or whatever it's called and you can bring your dogs (as long as they sleep in the outside sheds!) - that'll suit Molly - not! 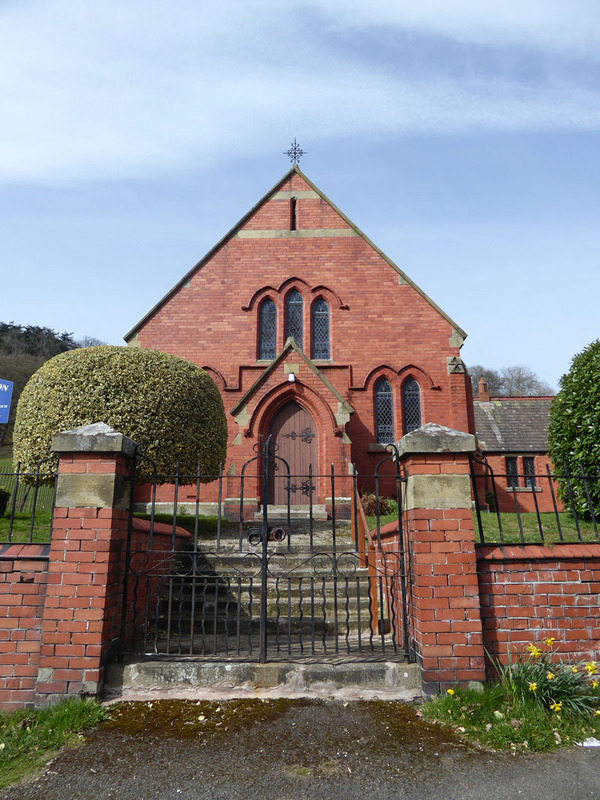 Built by engineer Charles Beyer - famous for...railway locomotive manufacturing and he is buried in the churchyard in the photo above this one. This area is packed with beautiful things and fascinating history. 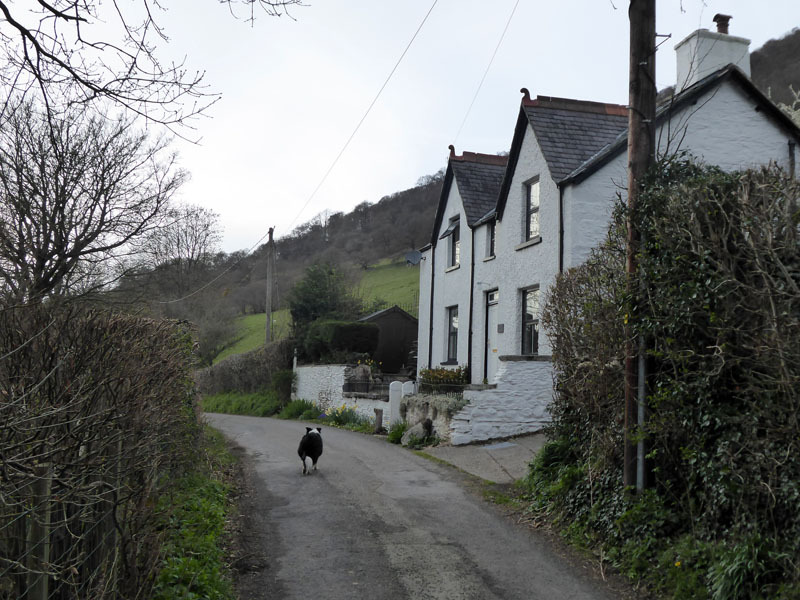 However...the walk now heads for Llandynan in the area of Rhewl and we are again plagued by sheepy fields and awkward stiles. 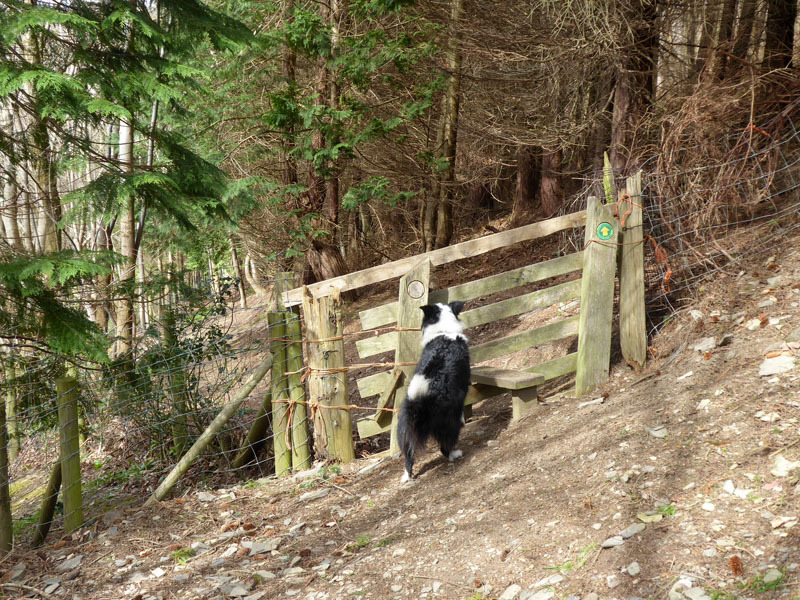 Luckily Molly is only about 20kg and accepts her fate at these obstacles and is clean, today. I always enjoy new territories and these little things are not too much trouble. You'll need a guidebook or map, or maybe both in order to follow the Dee Valley Way and it actually gets a little more challenging as we progress over the next hour or so. There was once a few pubs in this area, but now just The Sun Inn remains. 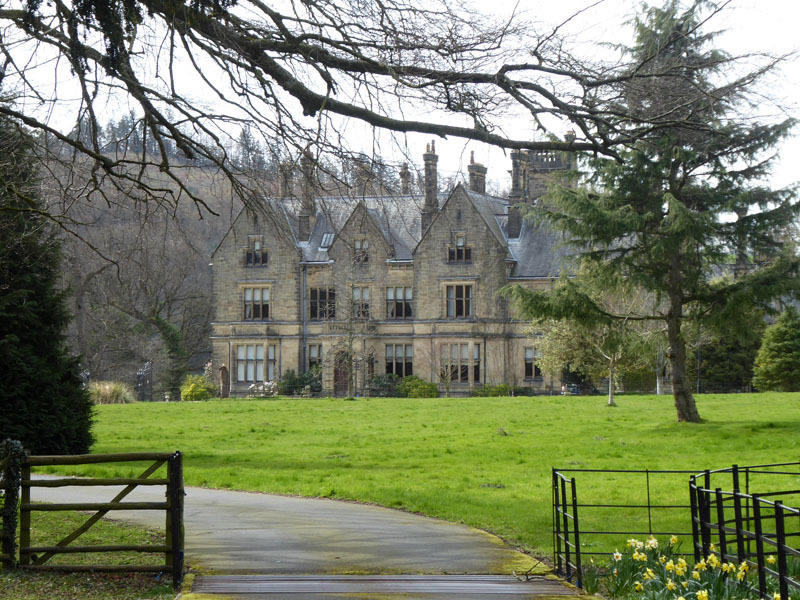 The walk assumes a track to Acer-ddu and then west to a framhouse, Cymmo - still using OS255 and following the waymarked "Dee Valley Way". 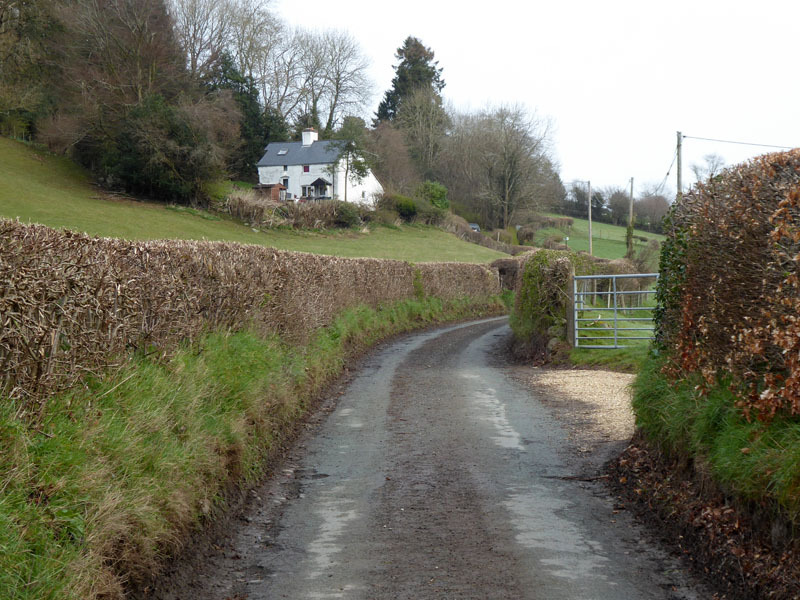 I decided to vary the route beyond Mynydd-bychan and the tree is somewhere near spot-height "327" on the map at approx. SJ 1580 4520. The DVW as I saw it on the map had too many long zig-zags and I wanted to straighten it out a little. I followed a feint track up on the hillside and was surprised to find a DVW waymark and yet, as far as I was concerned, I was nowhere near the official route. Much map studying and head scratching followed and I needed to find an obvious local landmark to confirm my position. 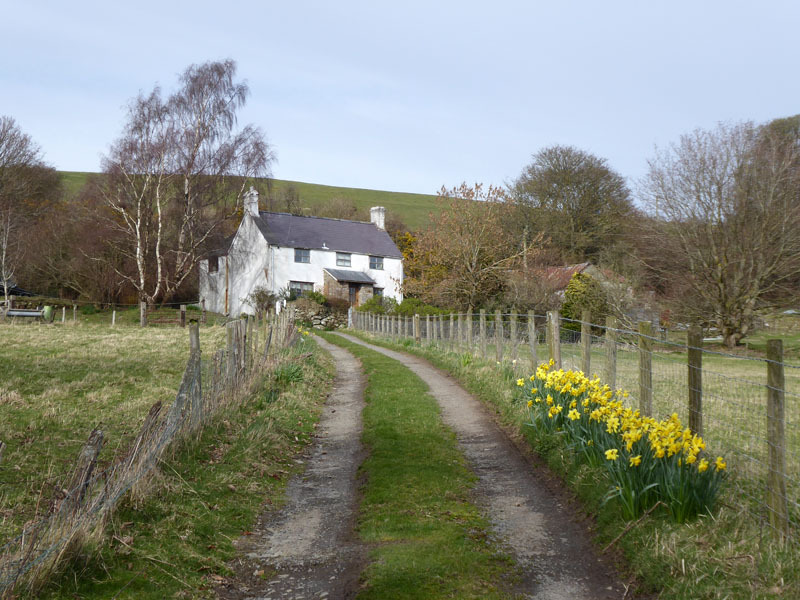 This is the position confimer, the unmistakable bends on the country road and we head over the moorland ahead to the farmhouse of Coed-drwg and hence Ty-canol. 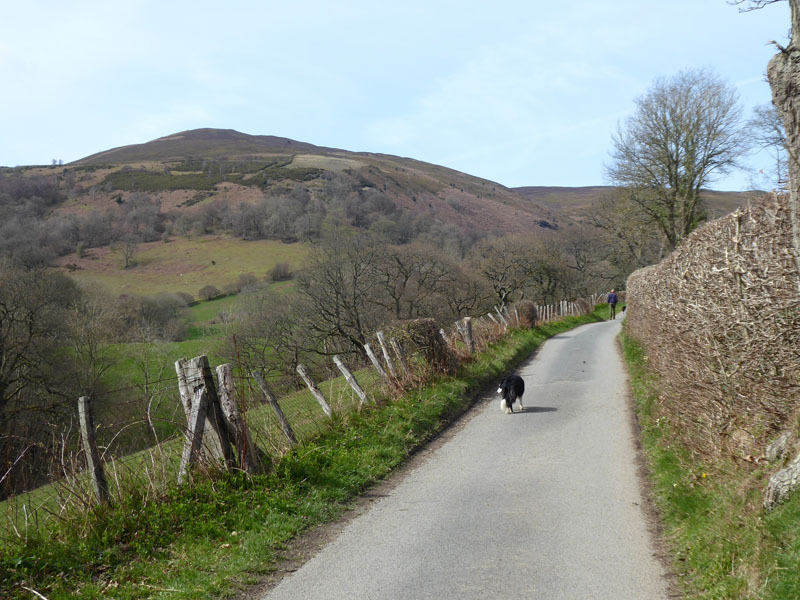 Looking back up the lane to the last farmouse on this version of the walk from Llangollen to Carrog. Soon enough, we resume the DVW and tackle the last climb of the day. 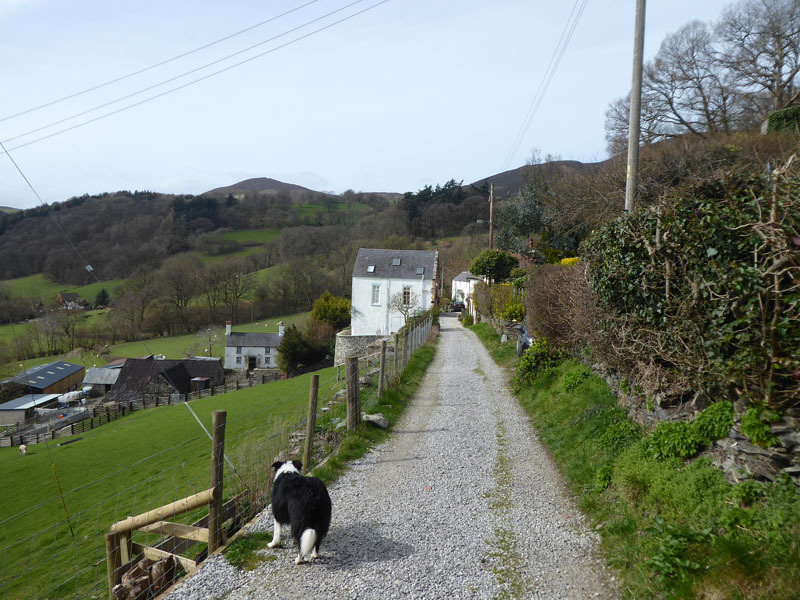 On the B5437 back to Carrog. 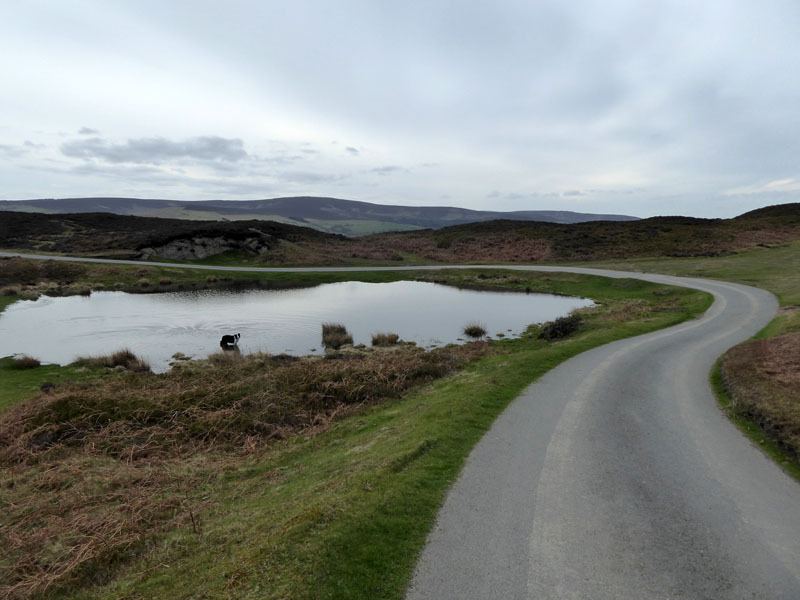 It turns out that there is more than one version of The Dee Valley Walk available on the internet, but only one shown on OS255. Hence I came across waymarkers where I was not expecting them. Confusing! The Dee Valley Way as sudied by me and the Dee Valley Way as found later. 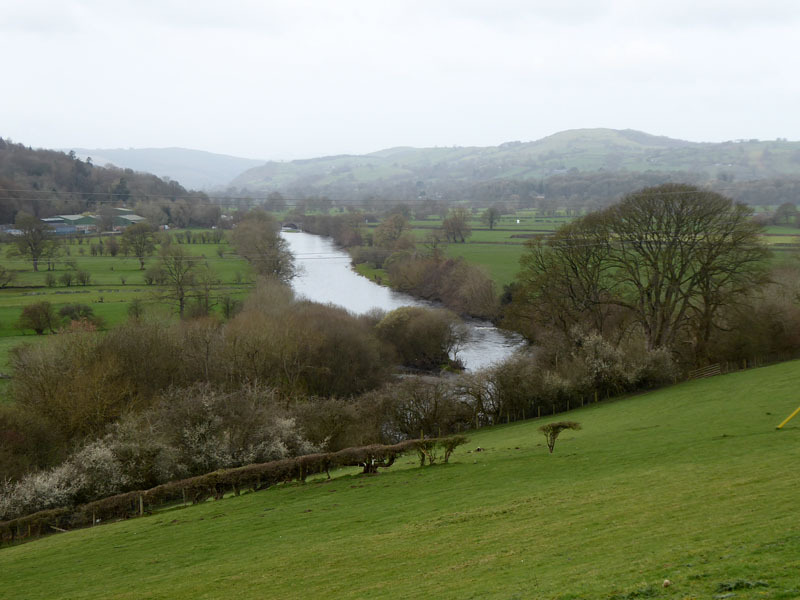 Route: Carrog to Corwen along the B5437 and farmland before following the farside of The Dee to Corwen. Bus to Llangollen. 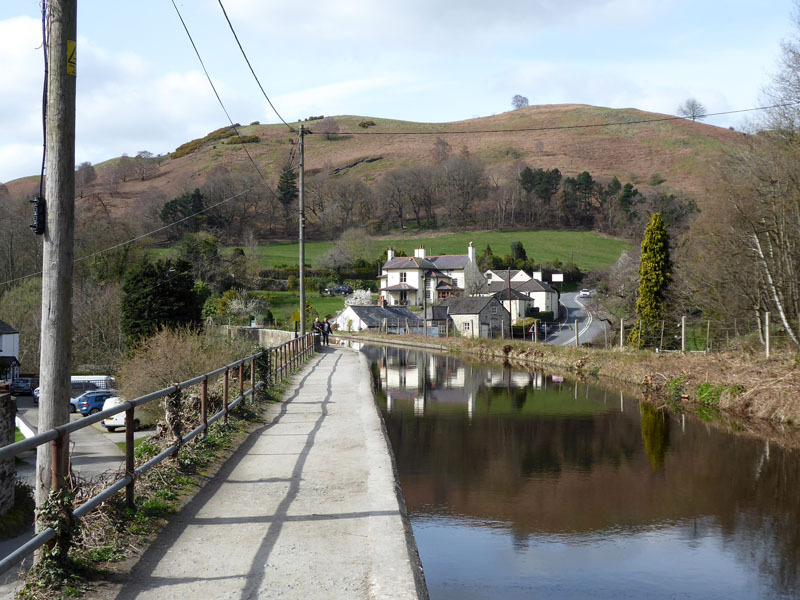 Canal to Horseshoe Falls at Llantysilio, Llandyman, Tyn Twll, Acer-ddu, Cymmo, Point 327, moorland to the kink in the country road, further moorland paths to Coed-drwg and Ty-canol. 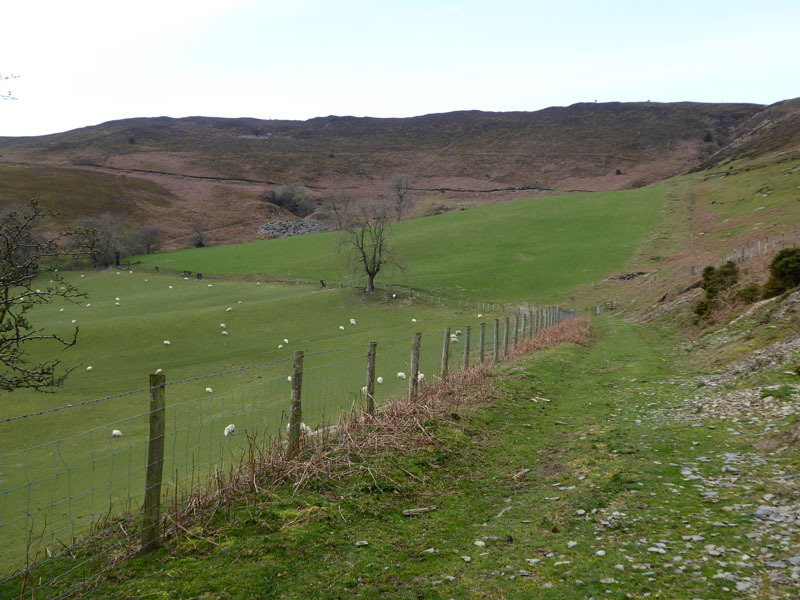 Track uphill behind un-named hill to descend to Ty Nant and Carrog. 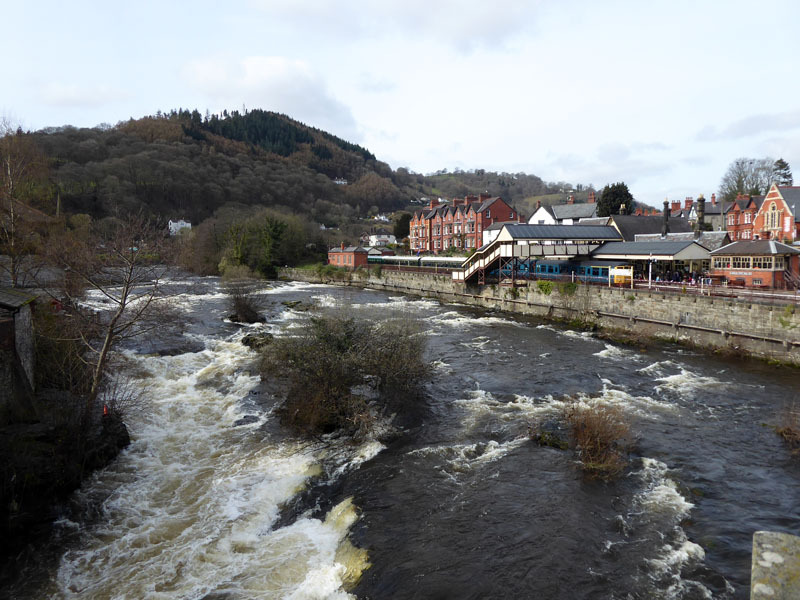 Refreshment Review: The Pretty Vintage Tearoom in Llangollen. Quaint and very well decorated little tearoom on Oak Street. A looped selection of "vintage" music must drive the young staff members mad. Properly served tea into china cups and a very tasty Eggs Benedict. Closed Sundays. Link, correct at the time of writing, goes to TripAdvisor. 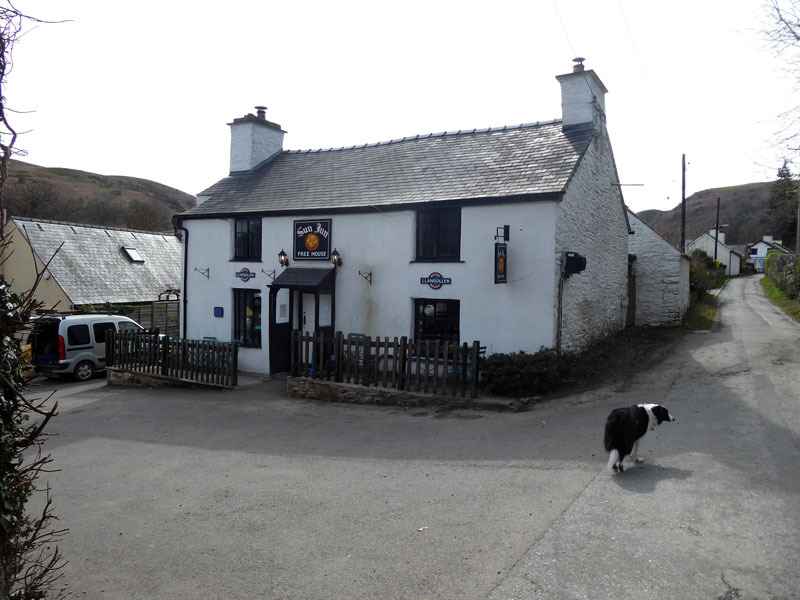 I had an evening meal at The Grouse Inn - Carrog on Friday and it was very good, but it got a bit noisy as time progressed and Molly is unsettled by such environments. I tried again on Saturday, but it was just too busy. Weather: Dry and cool, some sunshine.